Objective: There is a great recognition that store interiors and exteriors can be designed to create feelings in potential customers which can have an important reinforcing effect on purchase. In this study it is mainly aimed to explore the behaviors of the community pharmacists related to their store's physical environment. Also we aimed to determine whether any difference exist between behaviors of pharmacists serving in high and low socio-economic regions. Methods: A total of 200 pharmacists that work socio-economically different regions were randomly selected from 1424 pharmacists registered in Ankara Chamber of Pharmacists. A uniform questionnaire was applied to the pharmacists by using a face-to-face interview technique. Findings: There are differences in terms of behavior between the pharmacists serving in high and low socio-economic regions within the context of putting importance to their stores' atmosphere. More pharmacists attach importance to the physical sight of their pharmacy serving in high socio-economic regions (90%) vs. pharmacists in low socio-economic regions (70%). Also pharmacists in high socio-economic regions indicated higher importance level of selection of the decoration equipments (84%) than pharmacists serving in high socio-economic regions (60%). Conclusion: Our study suggests that some pharmacists pay more attention to interior atmospheric elements and others do not. There is a difference in terms of attaching importance to some store atmospheric elements (i.e. physical site, decoration equipment, it's color, wall color, etc.) serving in high versus low socio-economic regions in this context. There are numerous studies demonstrated that the physical atmosphere is important both for the employees and customers. Also for making good profits in various settings, the owners of the stores attach special importance to this subject. ,,,, On the other hand, the literature on pharmacy atmosphere is very limited, especially from the viewpoint of the pharmacist. In this context, there is a need to shed the light on this issue. When approached from marketing perspective, community pharmacy is a business enterprise as well as being first port of call for general advice on medicines and health. , As a result, pharmacy atmospherics and its elements become important for community pharmacies as well. Also it is a fact that physical environment of a pharmacy is not only a major factor influencing its success but also a key element to create a store atmosphere which is pleasing and conducive to shopping. Besides, Gagnon explored the factors that affect consumers' preferring a specific pharmacy. His study showed that as well as others "pharmacy atmospherics" is one of the most important factors when people decide to be a loyal customer of a specific pharmacy. However, the community pharmacists behaviors and opinions about their pharmacy atmosphere, especially interior atmospherics elements, still stay as unrevealed topics. Socioeconomic status is commonly conceptualized as the social standing or class of an individual or group. It is usually measured as a combination of education, income and occupation. In the light of this definition Turkish Statistical Institute (TurkStat) has a list of the high, low and average socio-economic regions' list for every city in Turkey. To our best of knowledge, there is not sufficient data on the physical atmosphere of the community pharmacies in terms of understanding how pharmacists act about their interior pharmacy atmospherics, to what extent they put emphasis on their pharmacies' interior atmospherics, what are the preferences of the pharmacists when they decide on their pharmacies' interior environment. By conducting this study, these issues will be explored. We also aimed to explore whether any difference will be observed in terms of the behaviors of pharmacists serving in high and low socio-economic regions as we hypothesized that the pharmacists serving in low socio-economic regions put less emphasize to their physical atmosphere of their stores. This is a cross-sectional, quantitative and descriptive type study. There were 1424 community pharmacists registered in Ankara Chamber of Pharmacists just before conducting our study. Taking into account this number, a chi-square test power analysis was done. And due to the power analysis, a sample size of 183 participants achieved 80% power to detect an effect size of 0.23 using a 2 degrees of freedom chi-square test with a significance level (alpha) of 0.05. Although the chi-square test power analysis showed us a sample size of 183 participants (pharmacists) will be sufficient for the study, we decided to include 100 pharmacists serving in high socio-economic regions and 100 pharmacists in low socio-economic regions of Ankara. TurkStat (Turkish Statistical Institute) which is located in Ankara has the list of the high- and low-socio-economic regions of Ankara. This list is obtained from this institution. On the other hand, Ankara Chamber of Pharmacists has the list of community pharmacies, the region of their location/address. We classified the pharmacies as serving low- and high-socioeconomic regions in the light of the TurkStat list. A total of 200 pharmacists that work socio-economically different regions were randomly selected from 1424 pharmacists registered in Ankara Chamber of Pharmacists' List of Community Pharmacies. A uniform and original questionnaire was designed by reviewing the related published literature on the topic of interest. The questionnaire contained mostly closed-ended questions with no scale. This questionnaire was pre-tested with 20 pharmacists who stayed out of our sample before the actual survey. Of these 20 pharmacists, 10 were serving in high socio-economic region and other 10 were serving in low socio-economic region. In the light of the pre-test, some revisions were made on the final questionnaire. The Cronbach's Alpha which measures the internal consistency was found to be 0.725. The actual survey was conducted with the community pharmacists between 5 October 2009 and 4 December 2009. Letter of authority for the survey was taken both from Hacettepe University Ethics Committee and the Ankara Chamber of Pharmacists. Data collection was carried out with the final revised questionnaire by the first author of this article using the face-to-face interview technique. Participation of the pharmacists to the survey was voluntarily. There were 26 questions in the questionnaire. The first part of the questionnaire included questions about socio-demographic characteristics and the second part of the questionnaire inquired questions about the pharmacy's physical atmosphere characteristics. After data collection, all analyses were performed using SPSS version 15.0 (SPSS, Inc., Chicago, IL). The chi-square test was used for statistical evaluations. Of all the interviewed pharmacists, 48 (24%) indicated that they are also the owner of his/her pharmacy's location, whereas 152 (76%) stated they are renters. 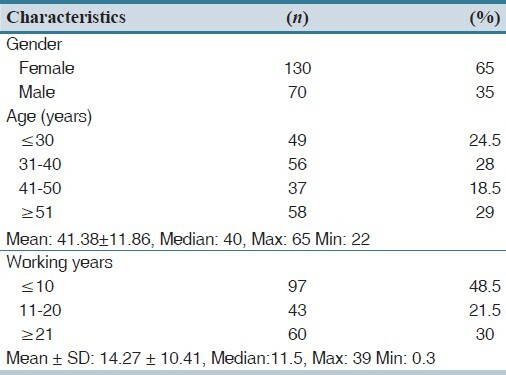 The demographics of the pharmacists participated in the study are given in [Table 1]. When pharmacists were required to point out to what extent they give importance to their pharmacy's physical atmosphere (the physical sight, cleanliness, the selection of decoration equipment, the selection of the color of wall and color of decoration equipment) the followings were obtained [Table 2]. From [Table 2], it can easily be observed that over three fourth of all the pharmacists pay importance (very important/important) to their pharmacy's physical atmosphere. 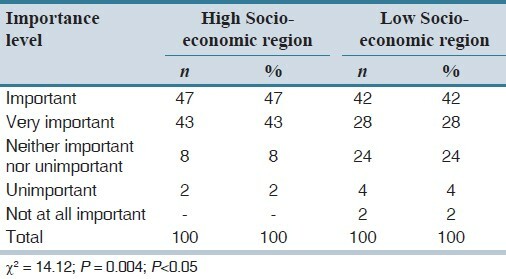 According to the pharmacy's location (being in high or low socio-economic region), the pharmacists' appraisal of importance level of their pharmacies' physical sight can be seen in [Table 3]. By conducting the chi-square test, a significant difference between the behaviors of pharmacists serving in high and low socio-economic regions was found (χ2 = 14.12; P=0.004; P<0.05). Considerably more pharmacists attach importance to the physical sight of their pharmacy serving in high socio-economic regions (90%) vs. pharmacists serving in low socio-economic regions (70%). Pharmacists' appraisal of importance level of their pharmacies' cleanliness in high and low socio-economic regions are compared. According to the chi-square test there was no significant difference between the behaviors of pharmacists working in high and low socio-economic regions (χ2 = 2.93; P=0.425; P>0.05). As a result over half of the pharmacists working in both high and low socio-economic regions stated that pharmacy's cleanliness is very important and important. 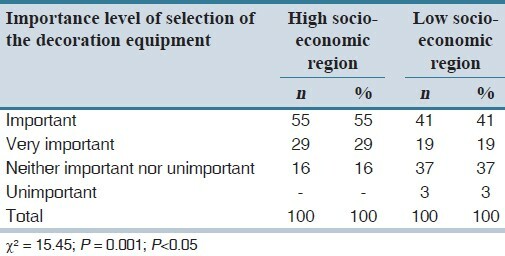 There was a statistically significant difference in the behavior of pharmacists in terms of selection of the decoration equipment (furniture/shelves) serving in high and low socio-economic regions [Table 4]. Pharmacists serving in high socio-economic regions indicated higher importance level of selection of the decoration equipments (84%) than pharmacists serving in low socio-economic regions (60%). For this physical interior element, none of the pharmacists indicated the "not at all important" option. 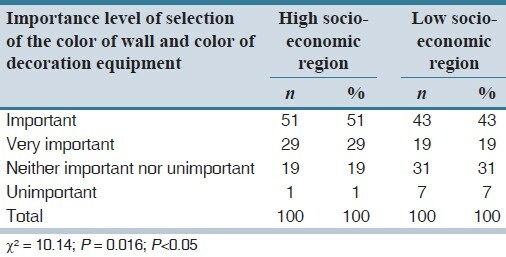 When the behaviors of pharmacists serving in high socio-economic regions compared with the ones serving in low socio-economic regions in terms of importance level of their pharmacies' selection of the color of wall and for decoration equipment a statistically significant difference was found [Table 5]. For this physical interior element none of the pharmacists expressed the "not at all important" option. Another physical atmosphere element is "music in the pharmacy." Whether the pharmacists play music in their pharmacy and how often they play it were two other questions those were searched. There is not a significant difference between the pharmacists serving in high and low socio-economic regions in term of playing music. Slightly more than one fourth of the pharmacists from both regions stated that they never play music in their pharmacy. The rest of the pharmacists stated they play music in their pharmacy with different frequencies. However there is a statistically significant difference between the pharmacists working in high and low socio-economic regions in terms of the type of the music they play in their pharmacy (χ2 = 7.99; P= 0.018; P<0.05). The preference of popular music in high and low socio-economic regions were 35 (47.2%) and 32 (47%), respectively. Of the 100 pharmacists serving in high socio-economic regions, 21 (29.2%) indicated that they prefer classical music in their pharmacy. However, only eight pharmacists (12.1%) in the low socio-economic regions prefer this type of music in their pharmacy. The last physical atmosphere element inquired was use of "scent in the pharmacy." There was no statistically significant difference between the pharmacists serving in high and low socio-economic regions in terms of scent use in their pharmacy (χ2 = 1.2; P=0.878; P>0.05). The ones who never use scent put forward either their asthmatic patients or their staff (sometimes including themselves) as being allergic to scents for not using them. Atmospheric music has been shown to influence customers in many ways such as: time spent, perceived waiting time, perceived event duration, product choice, desire to affiliate in buyer-seller transactions, perceptions of store staff, psychic costs, perceived monetary prices, perceived product, and service quality. , In our study, most of the pharmacists stated that they play music in their pharmacy too. There are studies showing that background music contributes to the customers' buying behavior in a positive way. ,,, But on the other hand, when music inside the store is too loud, this is a shopping irritant. And as a result of the loudness of the music the customer perceives the environment as unpleasant and tries to get out of the site quickly. In our study, most of the pharmacists stated that they play music both for themselves and their staff and for the customers. Because of long working hours, music in the pharmacy may have an alleviating effect on the staff's job stress. And also music can arouse a relaxing effect in both customers and pharmacy staff. In this study, the type of music played in high socioeconomic region pharmacies differed from low socio-economic region pharmacies. Classical music was preferred more by the pharmacists serving in high socio-economic regions. This maybe the result of customers being more cultured and familiar with this type of music in those regions as well as pharmacy staff's own choice. However, there is evidence that slow music tempo stimulates cognitive activity. On the other hand, music tempo plays a role similar to that of the voice intensity. It arouses attention when other cognitive cues are either absent or reduced. This may explain why the pop music preferred by the rest of the pharmacists serving both in high and low socio-economic regions. Store atmosphere is a vast topic which includes not only interior elements but also exterior elements, store design, and point of purchase arrangements and tools. In our study, we only investigated some interior elements such as physical sight, colors, music, and scent. There is a need to evaluate other atmospheric elements as well. Also our study findings are limited to the answers provided by pharmacists. For instance, we did not make any observational study by completing a check list of the color of the pharmacy walls (whether they are green, red, etc.) or lighting (whether the lighting in the store is enough). There is a room for other studies which would investigate this topic in depth both from employee and customer/patient perspectives. Our study suggests that there is a difference in terms of attaching importance to some store atmospheric elements (i.e. physical site, decoration equipment, its color, wall color, etc.) serving in high versus low socio-economic regions in this context. It is natural to see the differences in the behaviors of pharmacists'. But there is no doubt that using atmospheric elements with awareness will make employees and customers more loyal to a specific pharmacy. We are grateful to the community pharmacists who participated in our survey and allocated their valuable time. Also we thank to the Ankara Chamber of Pharmacists. All authors contributed the idea of research, design of study, data analysis and manuscript preparation. 1. Kotler P. Atmospherics as a marketing tool. J Retailing 1974;49:48-64. 2. Donovan R, Rossiter JR. Store Atmosphere: An environmental psychology approach. J Retailing 1982;58:34-57. 3. Berman B, Evans JR. Retail Management: A Strategic Approach. 11 th ed. New Jersey: Prentice Hall; 2009. 4. Bitner MJ. Servicescapes: The impact of physical surroundings on customers and employees. J Mark 1992;56:57-71. 5. Baker J, Levy M, Grewal D. An experimental approach to making retail store environmental decisions. J Retail 1992;68:445-60. 6. Baker J, Grewal D, Parasuraman A. The influence of store environment on quality inferences and store image. J Acad Mark Sci 1994;22:328-39. 7. Babin BJ, Attaway JS. Atmospheric affect as a tool for creating value and gaining share of customer. J Bus Res 2000;49:91-9. 8. Fiore A, Yah X, Yoh E. Effects of a product display and environmental fragrancing on approach responses and pleasurable experiences. Psychol Market 2000;17:27-54. 9. Yegenoglu S, Ozcelikay G. Counselling of pharmacists to community on issues rather than drug purchasing and drug related information: A survey in Ankara. Turkish J Pharm Sci 2005;2:83-91. 10. Pilnick A. Patient counselling by pharmacists: Four approaches to the delivery of counselling squences and their interactional reception. Soc Sci Med 2003;56:835-49. 11. Tootelian DH, Gaedeke RM. Essentials of Pharmacy Practice. St Louis: Mosby Inc; 1993. 12. Gagnon JP. Image is everything. Pharm Times 1990; February: 95-103. 13. Puccinelli NM, Goodstein RC, Grewal D, Price R, Raghubir P, Stewart D. Customer experience management in retailing: Understanding the buying process J Retail 2009;85:15-30. 14. Ariffin HF, Bibon MF, Saadiah RP, Abdullah R. Restaurant's atmospheric elements: What the customer wants. Journal of Asian Behavioral Studies 2011;1:33-43. 15. Grewal D, Bake J. Do retail store environmental factors affect consumers' price acceptability? An empirical examination. Int J Res Mark 1994;11:107-15. 16. Campbell DE. Interior office design and visitor response. J App Psychol 1979;64:648-53. 17. Gardner MP, Siomkos GJ. Toward a methodology for assesssing effects of in-store atmosphere. In Advances in Consumer Research. Ed. Richard Lutz. Chicago, IL: Association for consumer research; 1985. p. 27-31. 18. Goel B, Dewan B. Factors affecting consumer preferences of shopping at organised retail stores in Punjab. Journal of Engineering Science and Management Education 2011;4:44-9. 19. Crowley AE. The two dimensional impact of color on shopping. Market Lett 1993;4:59-69. 20. Bellizzi JA, Crowley AE, Hasty RW. The effects of color in store design. J Retail 1985;59:21-45. 21. Verhoven JW, Pieterse ME, Pruyn AT. Effects of interior color on healthcare consumers: A 360 degree photo simulation experiment. Adv Consum Res 2006;33:292-3. 22. Yildirim K, Akalin-Baskaya A, Hidayetoglu ML. Effects of indoor color on mood and cognitive performance. Build Environ 2007;42:3233-40. 23. Vaccaro V, Yucetepe V, Torres-Baumgarten G, Lee MS. The relationship of music-retail consistency and atmospheric lighting on consumer responses. Rev Bus Res 2008;8:214-21. 24. Graa A, Dani-elKebir M. Application of stimulus and response model to impulse buying behavior of Algerian consumers. Serbian Journal of Management 2012;7:53-64. 25. Milliman RE. Using background music to affect the behavior of supermarket shoppers. J Mark 1982;46:86-91. 26. Herrington JD, Capella LM. Effects of music in service environments: A field study. J Serv Mark 1996;10:26-41. 27. Ghosh P, Tripathi V, Kumar A. Customer expectations of store attributes: A study of organized retail outlets in India. J Retail Leis Property 2010;9:75-87. 28. Morrison M, Gan S, Dubelaar C, Oppewal H. In-store music and aroma influences on shopper behavior and satisfaction. J Bus Res 2011;64:558-64. 29. d'Astous A. Irriatting aspects of shopping environment. J Bus Res 2000;49:149-56. 30. Chebat JC, Chebat CG, Vaillant D. Environmental background music and in-store selling. J Bus Res 2001;54:115-23. 31. Spangenberg ER, Crowley AE, Henderson PW. Improving the store environment: Do olfactory cues affect evaluations and behaviors? J Mark 1996;60:67-80. 32. Bone PF, Ellen PS. Scents in the marketplace: Explaining a fraction of olfaction. J Retail 1999;75:243-61. 33. Fiore AM, Yah X, Yoh E. Effects of a product display and environmental fragrancing on approach responses and pleasurable experiences. Psychol Mark 2000;17:27-54. 34. Spangenberg ER, Grohmann B, DE Sprott. It's beginning to smell (and sound) a lot like Christmas: The interactive effects of ambient secnt and music in a retail setting. J Bus Res 2005;58:1583-9.